It was the spray tan that did me in. See, the minute you have the word beauty in your blog’s metadata, the Marketing Powers That Be descend upon you with offers of free samples for your review. Lotions, polishes, tonics, scrubs, glosses, serums, creams—if it’s in a bottle and designed to perform miracles, its press release may find its way to my inbox. So the lure of free products didn’t hold much sway over me; I still have a handful of unopened products from various beauty sales over the years. More important, I prided myself on not falling into the advertorial trap: No, I was not going to give companies free advertising—that is, my time and labor—in exchange for a prettily packaged batch of titanium dioxide. There’s absolutely nothing wrong with doing that, but A) there are plenty of product review blogs already, and I have nothing to add to the chorus except SEO bumps for the companies; B) that’s not what this blog is about, and in fact when trying to explain what I do here, the first words out of my mouth are usually something like, “It’s a beauty blog, but not, like, lipstick reviews”; and C) after years of working in ladymags, I’ll be damned if my passion project—for which I receive the occasional stipend from my syndication with The New Inquiry but which otherwise isn’t monetized in any way—was under the sway of anything other than my editorial judgment. I decided long ago to not have advertising or sponsors for this reason—even from companies and organizations I think do good work. And then came the spray tan. So when the invitation to “meet Kelly and get a B. Bronz Sunless Tanning Treatment” showed up in my inbox (something to do with Fashion Week? ), I deleted it at first, as I do all such invitations and offers, no matter how much the product promises to “dazzle” my readers. But it stuck in my mind. I found myself getting sort of huffy over my own policies, like, Hey, why shouldn’t I be getting the occasional swag? I work hard! Harder than I did in magazines, when I could buddy up to the beauty editors and waltz out of the closet with a lifetime supply of conditioner! You know who pays this blogger's salary? Me! And I’m cheap! And I abuse my staff! And if I weren’t such a rotten boss I might have gone to the beach even more this summer and might have a deeper tan and I wouldn’t even need this body spray-paint thing in the first place, so take that! I did my homework beforehand; I knew you were supposed to exfoliate and not use any body products so that the tanning agent would be able to better sink in. I also knew you weren’t supposed to sweat for 8 to 12 hours afterward, which might be fine if one’s body is spray-painted in the Helsinki twilight but is more difficult in the recent spate of 90% humidity we subtropical New Yorkers sweat our way through. I showed up at the spa that was hosting the event and was ushered into the treatment room, where I did indeed meet Kelly, a polished, gracious woman in flowing jersey who looked far less...fake?...than I’d expected from someone who paints people brown for her trade. Actually, as it turns out, Kelly is both artist and chemist: She created the B. Bronz line, which is available both for professional and home use and, from what I saw on the bottles, comes in fragrances like “Citrus Mojito,” which surely is far more appealing than the lingering scent of yo, you just dyed your body brown that I’m all too familiar with from my usual sunless lotion, which shall remain nameless (see paragraph 5). Kelly has the distinction of having tanned members of the National Bodybuilding Association, the San Francisco 49ers Gold Rush Cheerleaders, and the Oregon Ducks Cheerleaders (my alma mater! also, it is impossible to get a natural tan in Eugene, Oregon), as well as Miss Washington, Miss Oregon, Miss Michigan, and Miss California. If I was going to have someone spray-paint my body, I may as well go to the best. I’d been trying to look Kelly in the eye to telegraph how terrifically secure I was standing almost entirely naked in front of a stranger, but at a certain point I looked down at my arm and saw that it was a gorgeous golden hue, more glowing and vibrant than how I look when I’ve actually been sunbathing. “It’s gorgeous!” I exclaimed, and I meant it, and Kelly smiled before she frowned and started dabbing my cleavage with a towel. “You’re sweating a little,” she said, “so this was getting...funky.” I looked down and saw that my chest looked like someone had splattered coffee across it, brown beads dripping between my breasts. I stood there trying very very hard not to sweat, while my body dried off for a couple of minutes until Kelly gave me her blessing to get dressed. Which was nice, except then I’d have to exit the cool spa and enter the world of 90% humidity, which I feared meant my entire body would soon look the way my cleavage did. In the subway—possibly the most humid place in New York City save the Tenth Street Russian & Turkish Baths—I stood in the darkest place possible while fanning myself with B. Bronz literature and rubbing my face with a tissue in hopes of at least evening out the sweaty brown beads of body dye that were surely forming there. I studiously avoided eye contact once on the train, hoping to avoid the humiliation of others witnessing me turning into a live Jackson Pollock painting—good thing, too, because when I got up I saw that I’d left a trail of brown drops across the back of the seat. Having lost all dignity, I made a beeline for home and raced to the mirror, where it turned out that it was only my back and chest that had become mottled (and which was easily taken care of by rubbing in the solution). The rest of me, including my face, had a soft tan glow. Throughout the day, the tone became richer and deeper—though when I took a shower after the prescribed length of time and rinsed off the bronzer, I was left with a golden hue closer to what I’d first seen when Kelly sprayed me in the tent. It lasted for about four days; I can still faintly see the “tan” lines from where my underwear was but it’s barely noticeable. 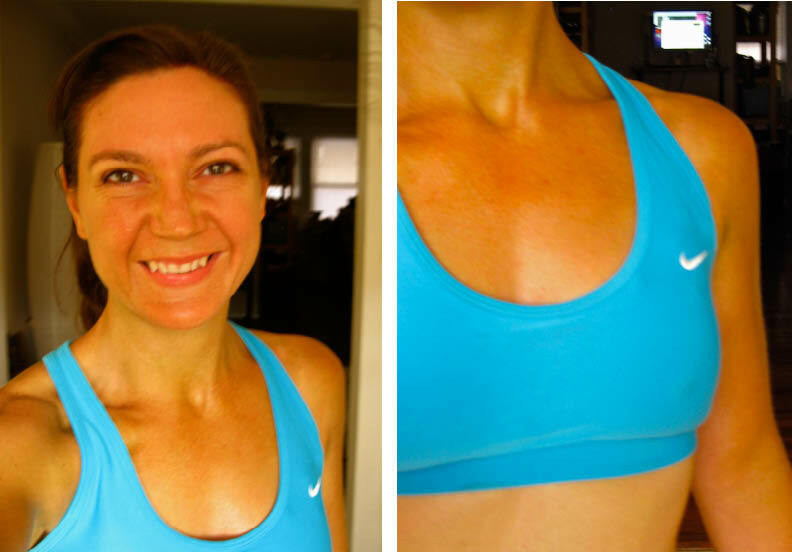 Forgive the sports bra shot; I already had a light tan on my upper body but my stomach hasn't seen the sun since 1979, so here's the color the spray-paint—ahem, airbrush tan—gives unsunned skin. All this is to say: It was absolutely fine. Given that there is now a seat on the Q train with a spatter of brown liquid gifted from my body to the MTA, I can’t quite fully sign on to the B. Bronz statement—“The B.Bronz Sunless Tanning Treatment is designed to be applied flawlessly in less than two minutes, and there is no mess, residue, or rub-off, which is perfect for Fashion Weeks' high demands”—but that’s my own damn fault for daring to sweat before the 8 hours were up, right? If you’re someone who would spend money on having a stranger spray-paint your body brown, the B. Bronz line is more than adequate; I’ve seen some airbrush jobs look hideous the same day, while this looked nice and natural even at its darkest. All this, really, is to say: Thank you, B. Bronz, for the free airbrush tan, which was perfectly nice. And thank you, readers, for allowing me a forum where I can write about beauty without feeling like I need to write about airbrush tans, even the perfectly nice ones—because in attempting to write about it today I find that I don’t know how to do so without swallowing my voice. Which is the opposite of the reason I write here. Awesome thinking. It's seems like a great blog i have ever seen. Thanks for sharing this wonderful review. The same set of rules, laws, and best practices will be applied to the inside painting jobs that one tries. as an example, older coats of paint would possibly ought to be removed or in some cases, they have to be repaired, for more information click here pressure cleaning palm beach. More and more women are leaving the corporate world behind to try their hand at traditional homemaking. Being a wife and homemaker is a considerable responsibility Nike Air Jordan Mens in itself. Many women choose to work outside of the home to supplement their husband's income and experience personal fulfillment through success in their chosen profession. The two income family is now the norm. With the arrival of the first bundle of joy, comes many conflicting emotions and struggles. The wife and mother must now juggle attention to her husband, cooking, cleaning, shopping, errands, and motherhood with her career. Their desire may be to nurture and protect her children and husband nut the expectations and time constraints imposed upon her often force her to compromise those desires. This can result in guilt and depression in the over burdened woman. It may not Nike Air Yeezy be a coincidence that divorce has become more prevalent and children more delinquent since the rise of Nike Football Boots two income families. Women are often finding themselves drained emotionally and physically from the dysfunctional patterns of behavior that are imposed on them by today's society. Many women are fighting back by starting a home based business. By working from home, women can now set their own hours, save time and money and spend Air Force 180 Mid more time with their children. With a little help, home based businesses can bring in a decent supplemental income with less Air Jordan X 10 hassles than the Air Jordan Mens Sandals Shoes corporate world offers. Mothers can hire part time nannies instead of full time sitters and can arrange for childcare to be done in their own homes. This allows peace of mind for the mother and a chance to squeeze in quality time with the children during breaks, have picnic lunches on the lawn and never Designer Shoes miss another Air Jordan 23 Degrees F chance to kiss away a fresh boo boo. Hiring some childcare help during busy seasons in your business can help you Air Jordan PRO Classic keep your Nike Dunk Mid Mens Shoes sanity. On slower days, the children can so quite well if they are kept in a structured environment and on a schedule. This takes preparation. Plan quiet times around favorite television shows, set up crafts and activities that require minimal supervision and intervention on your part. Prepare snacks and sippy cups in advance so toddlers can help themselves when hunger strikes. By keeping mealtime and naps on a schedule, you can be better prepared to give an estimated time for that conference call or know when a meeting time is absolutely out of the question.